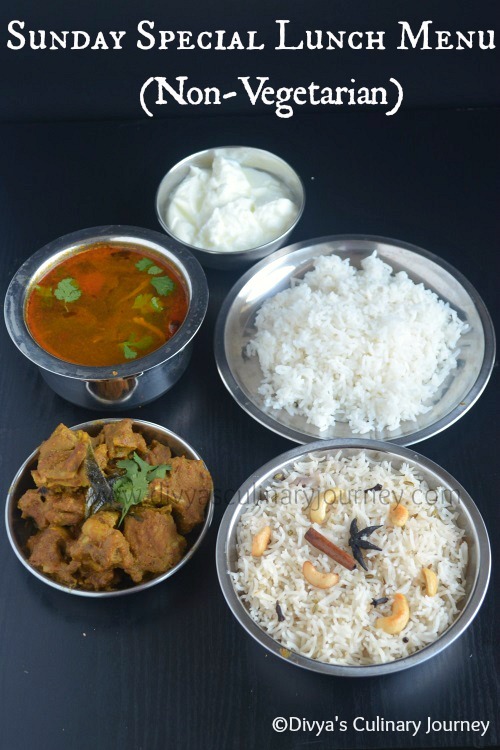 I love Rasam a lot and I often make rasam at home. 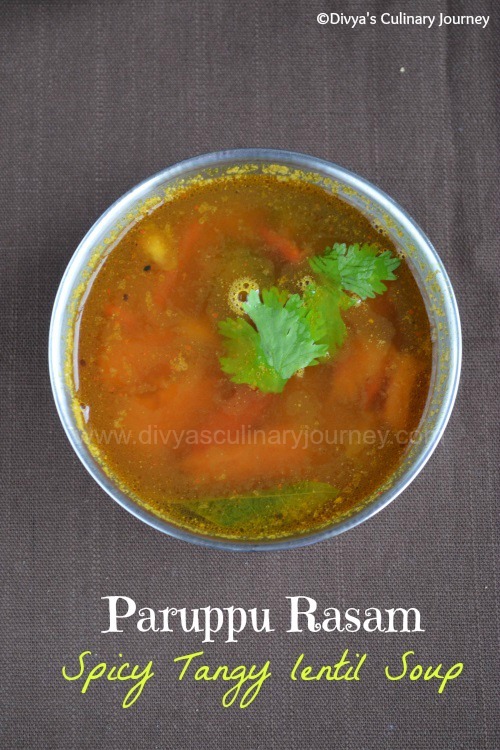 Today I am posting Paruppu Rasam recipe. I have already posted two rasam recipes - Simple Rasam & Garlic Pepper Rasam, both doesn't require rasam powder. But I made this rasam using rasam powder. I will post the recipe for rasam powder too shortly. This rasam is made without garlic. This rasam is so flavorful and healthy. Warm Rasam with Rice and appalam is always a heavenly combination. August has been a month of celebration with dear ones celebrating birthdays one after the other. Now it is my dear friend Manjula's birthday. Happy Birthday, Manjula!! She is one of the very good friends I have got through blogging. Facebook has a main role in helping with the growth of this friendship. The chats, the giggles, the sharing of joys, sorrows, fears, etc., etc., what not. She is such a sweet cheerful person who can lighten up any moment. She is also an enthusiastic blogger. You all might know about the ghevar and Rajasthani thali she made for the SNC challenge, the beautiful breads she challenged for HBC challenge. Also the event, "Come on- Lets Cook Buddies" she conducted in her space for the non bloggers was very successful. I am really amazed by the amount of effort she puts in each day for her blog, the cooking and the clicking with her energetic toddler around. Since it is her birthday today, we friends decided to treat her virtually with the theme Thalis. 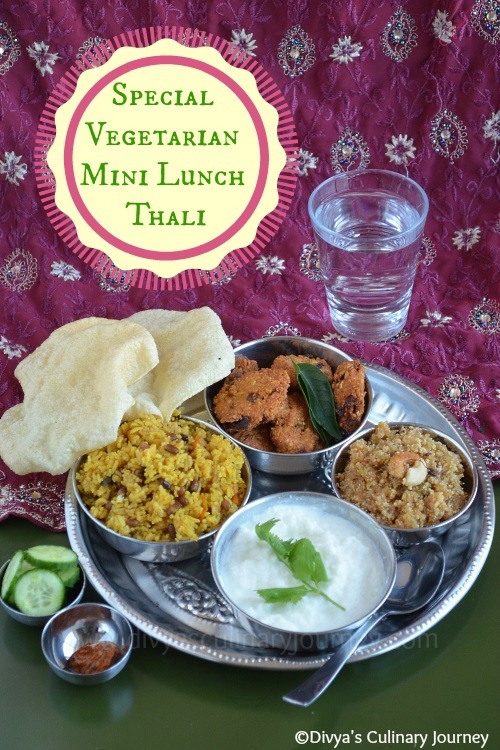 I prepared a special Vegetarian Mini Lunch Thali. Today I am sharing with you a lunch I prepared last Sunday. Of course, Sunday means definitely non vegetarian. 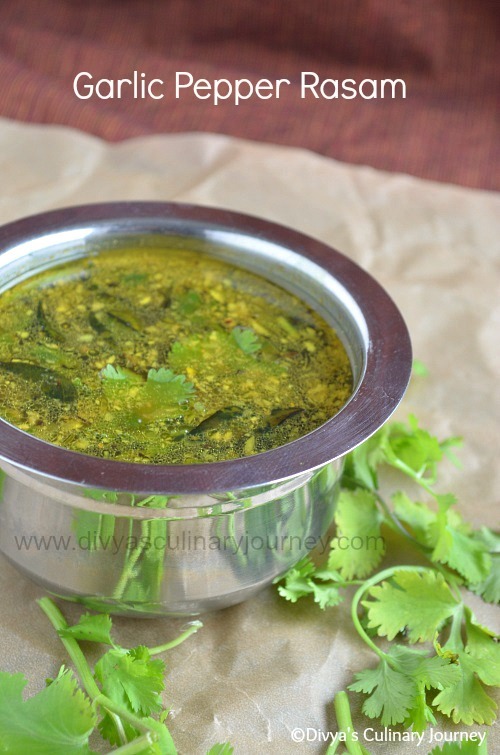 Today I am sharing with you a simple and easy to make Rasam recipe- Garlic Pepper Rasam. 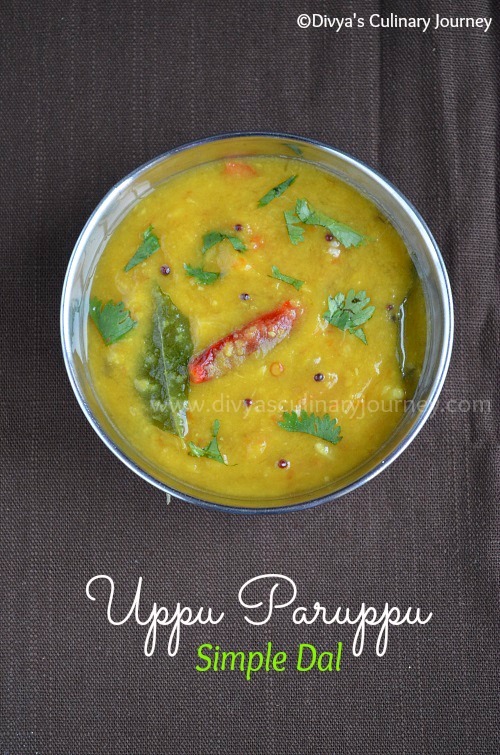 It is very quick to make too and doesn't require rasam powder, Dal or even tomato. As the name suggests the flavor of pepper and garlic is predominant in the rasam. This rasam aids in digestion and also can be had as a remedy for cold. Today I am sharing the recipe of Besan Burfi I prepared for Rakshabandhan. This festival celebrates the relationship of brother and sister. And having an amazing brother, I would never want to miss this festival. But my brother is far away in Philippines and it is almost 5 years now since I met him in person. Every year I do wish for the next rakhi, he is with me. Hopefully next year my wish comes true. My kids celebrated Rakshabandhan. Here is the picture of my daughter tying rakhi to my son. Hope you all had a wonderful celebration too. Do share with us how you celebrated the day. 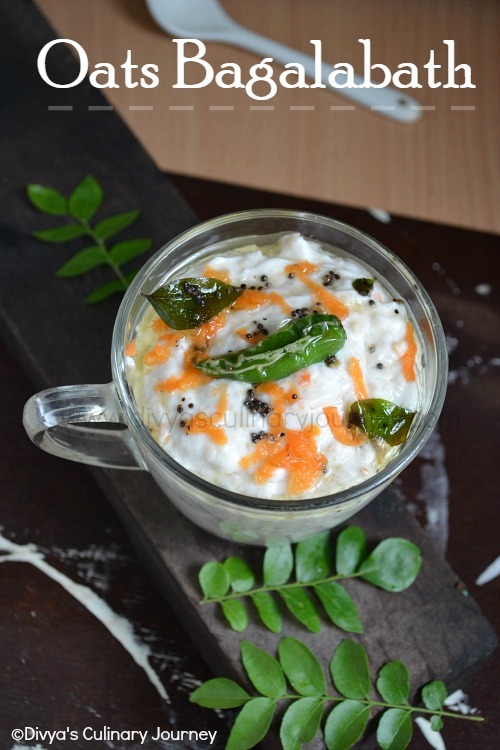 Today I am posting a simple recipe- Onion Raitha. 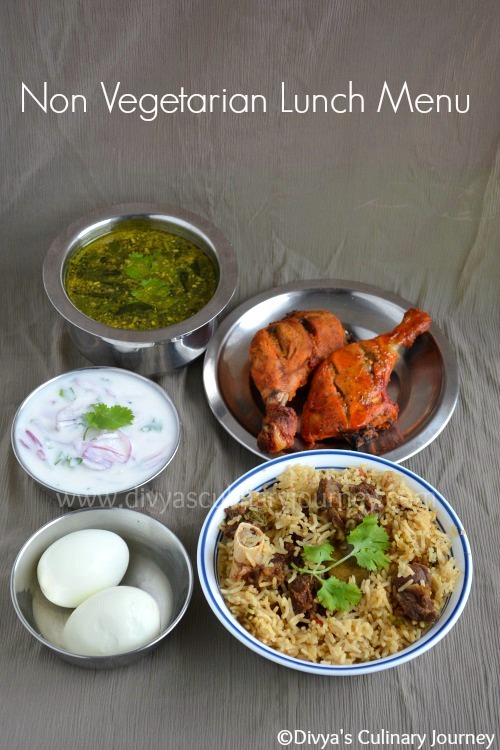 It is a perfect side dish to Biryani. I would rather say Biryani is incomplete without Raitha. 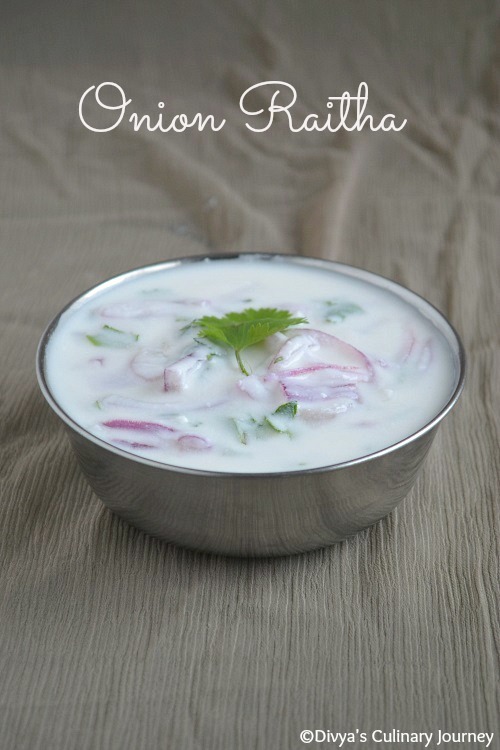 Though there are different types of raitha, I am posting the basic onion raitha which can be whipped in seconds. 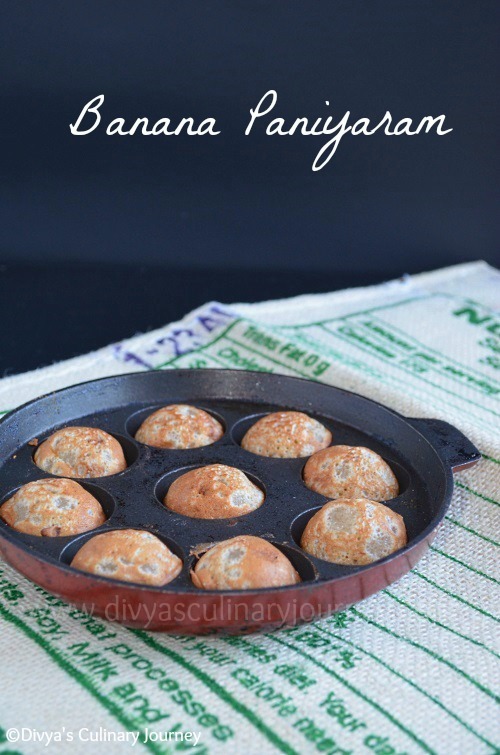 Today I am posting Banana Paniyaram, Indian version of Aebleskivers. I tried this recipe from my friend Preeti's site. Her site is full of great recipes with interesting combination and amazing photographs. Though I have bookmarked a lot of recipes from her site, for now I tried out this simple snack. This is a easy to make snack, which can be prepared instantly and also it requires few ingredients. My kids loved this and they gobbled it, as I took it from paniyaram pan (couldn't wait for it to cool down too). If you have ripe bananas, hungry kids and not much time, then this is the snack for you. Today I am posting Asian Style Chocolate Marble Bread prepared using roux method, which is also known as tangzhong method. 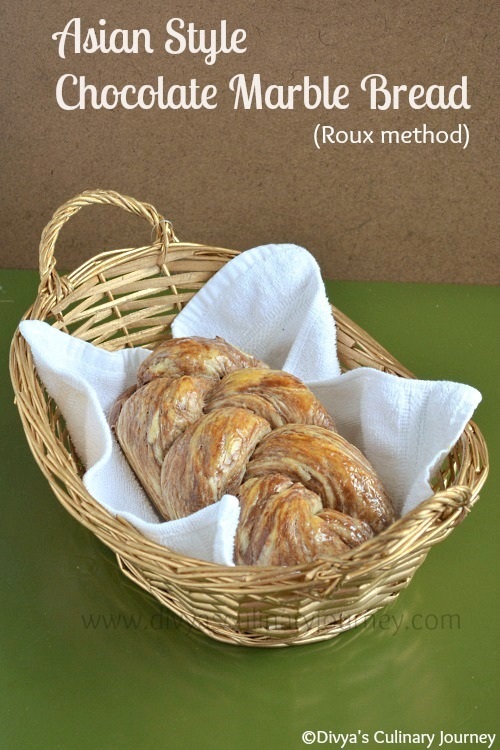 A roux starter (water and flour mixture) is prepared and then added to the other ingredients and then the bread is baked, which results in super soft bread. I have already posted Japanese style Hokkaido Milk Toast using this method. Today's bread is a Chocolate Marble braided bread. This bread is not too sweet and it can be had with nutella to give a boost to the chocolate flavor. Today I am posting Brioche Rolls with Nutella. 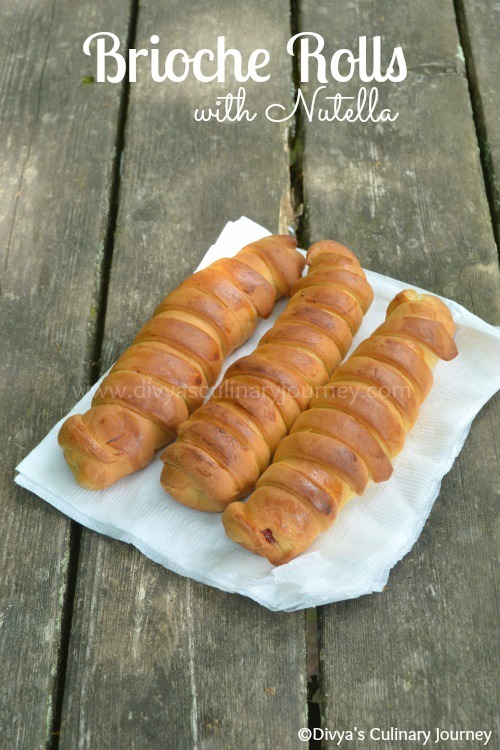 I got the recipe for this brioche rolls from Priya Akka's site. I baked this for a picnic , this brioche has a shiny beautiful crust and is soft on the inside with nutella filling makes it a perfect package for the picnic. Since I could not click this at home because of lack of time, I clicked few pictures on the picnic site. These brioche were delicious and was a hit. Since it is Sunday today, I am posting a non vegetarian Lunch menu. Today I am here with Blueberry Frozen Yogurt (Fro-Yo). I wanted to try frozen yogurt at home for a really long time. I had lot of blueberries left so I decided to try blueberry frozen yogurt. The blueberries gave a beautiful colour and flavour and made it very attractive to the kids. My kids loved it and they have been requesting me to make it again already. 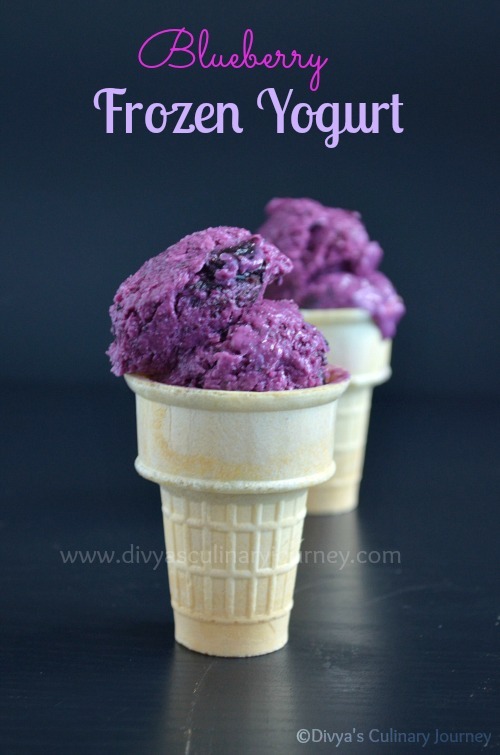 The process of making home made frozen yogurt is very simple - Strain the yogurt to remove excess liquid, prepare blueberry sauce/ compote then mix yogurt and sauce together, then let it set in the freezer, then scoop it and serve. 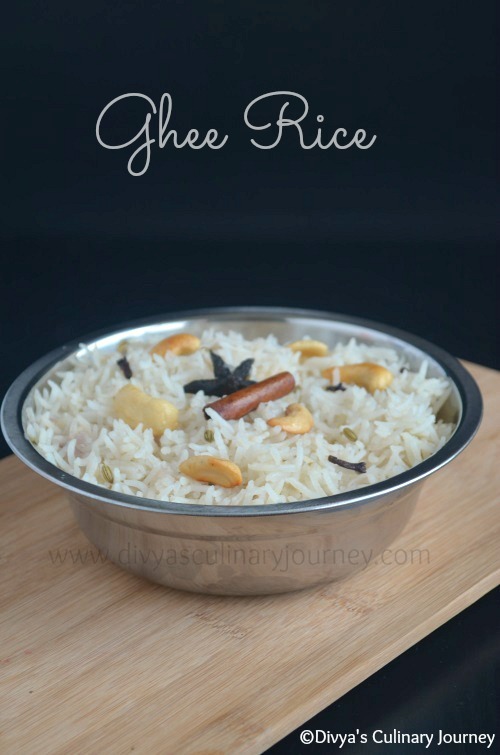 Today I am posting Ghee Rice. I prepared this rice and clicked few weeks ago and it has been sitting in my draft for quite sometime. I have been working on the post for the past 2 days but still couldn't post it. Today I am determined to post it. 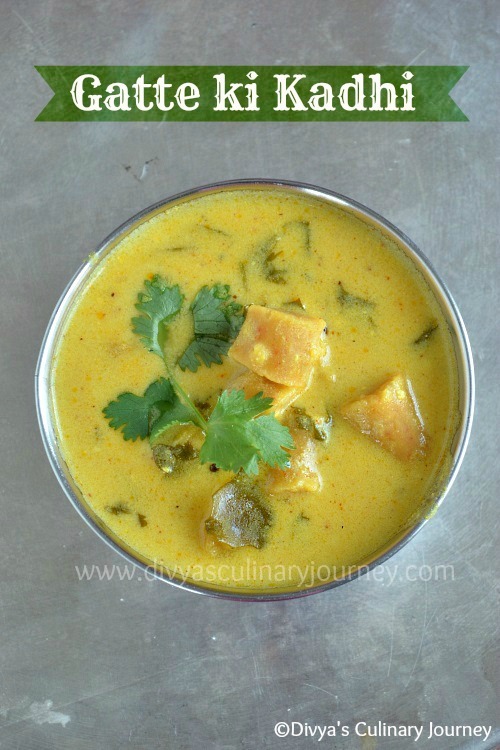 Today I am posting another recipe I made for Rajasthani Thali- Gatte ki Kadhi. 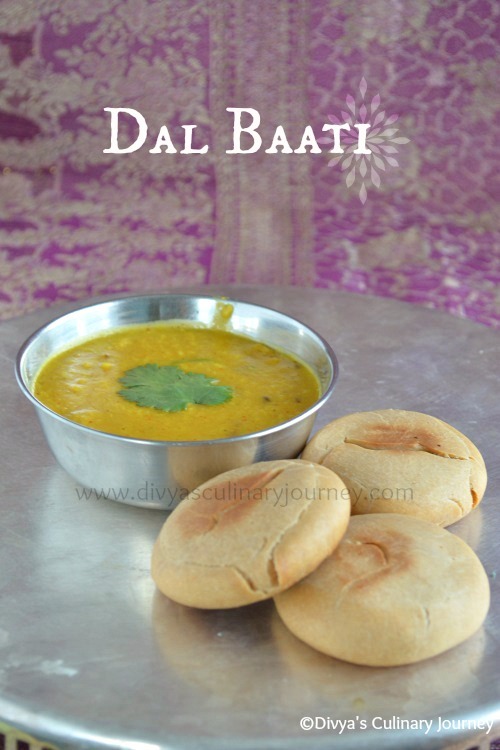 Gattas are the gram flour dumplings that are boiled and sliced to bite sized pieces and are simmered in a yogurt based gravy(Kadhi). I served it with rice and it also can be served with parathas. 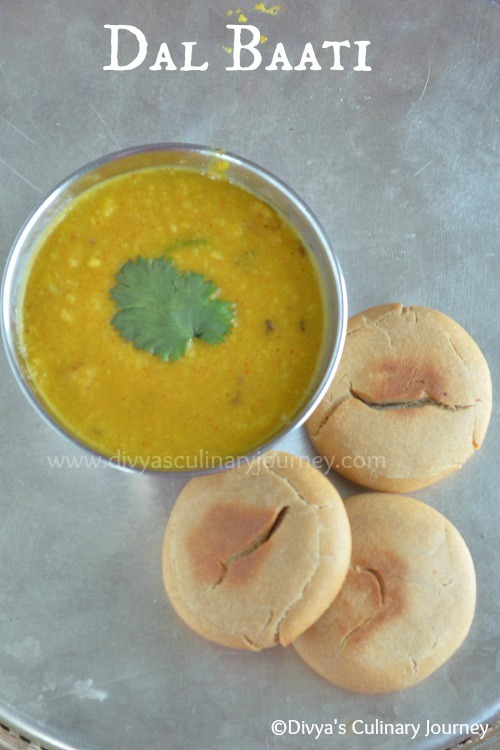 Today I am posting a simple dal recipe. It is Uppu Paruppu. Split Pigeon peas/ Toor dal is cooked and tempering is added to it. That is all. It is very simple and easy to make, also it is Vegan. 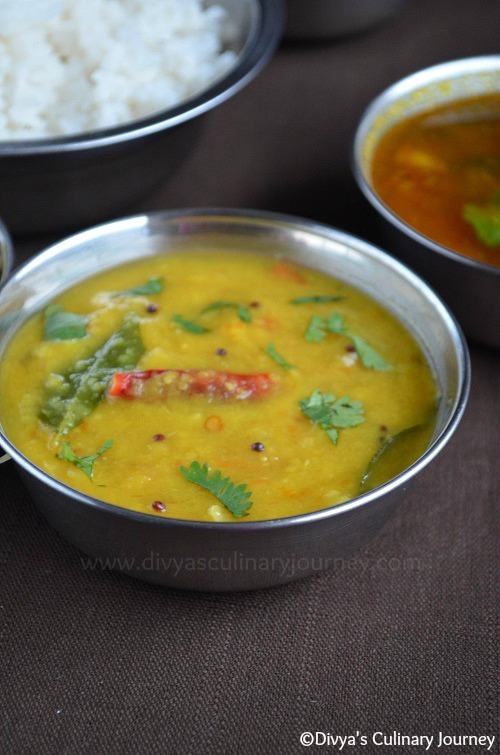 My kids love this dal when served with rice and dollop of ghee. Not only them, even I love too. It is just very comforting. Wash the Dal and pressure cook it along with the ingredients listed under 'to pressure cook'. Then wait till the pressure releases and mash them well. Then heat oil in a pan, add mustard seeds, cumin seeds and then add red chillies, onions and curry leaves, asafoetida and fry for a minute or two till onion turn translucent. To this add the mashed dal, mix well, salt to taste and turn off the heat. If needed, add little water to dilute the consistency, otherwise no need. Garnish with cilantro and serve it with rice.